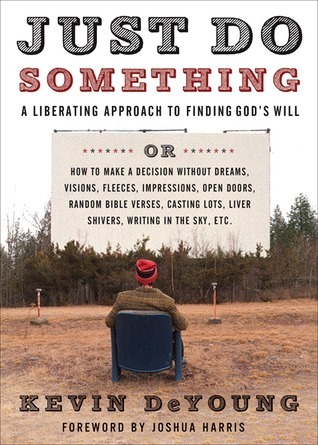 A Liberating Approach to Finding God's Will or How to Make a Decision Without Dreams, Visions, Fleeces, Impressions, Open Doors, Random Bible Verses, Casting Lots, Liver Shivers, Writing in the Sky, etc. Pastor and author Kevin DeYoung counsels Christians to settle down, make choices, and do the hard work of seeing those choices through. Too often, he writes, God's people tinker around with churches, jobs, and relationships, worrying that they haven't found God's perfect will for their lives. Or—even worse—they do absolutely nothing, stuck in a frustrated state of paralyzed indecision, waiting . . . waiting . . . waiting for clear, direct, unmistakable direction. I really enjoyed this short easy-to-read book. For me personally I could not have found this book at a better time. I really want to do what God wants me to do, so I pray wondering what in the world am I suppose to do. This book had a new approach to the idea that I really liked. Instead of waiting around thinking you are waiting for God's will, sometimes you just have to do something. The author talks about how my generation has become lazy, which is true, and how we expect a lot more out of life than our ancestors did. I agree with this as well. He also writes James 4:13-15 where God says you don't know what is going to happen tomorrow and God is in control. There were a few things that I didn't agree with on his thoughts of marriage except that we need to be equally yoked. Live your life to the glory of God is the main idea with this book and I liked it. It's a fresh approach and it's all based on what the Bible says in context.